Cast resin, with a white base. 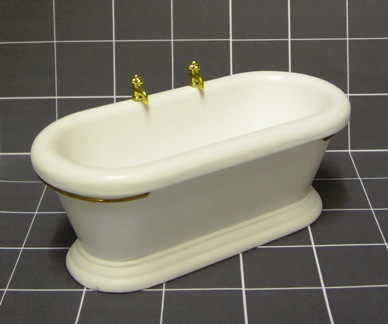 This is a mass-produced item that can look very effective in a modern bathroom. Try painting the outside in a deep tone (we took inspiration from the Netflix blockbuster featuring the Versace bathroom and painted ours vibrant pink! But deep teal or silver, even black, would look stunning! Measures 5 1/4" (13cm) long, 2 1/4" (6cms) wide and 2 1/8" (5.5cms) high.